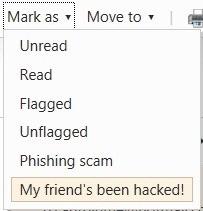 A commonality in hacked Hotmail accounts is a weak password. A weak password is not only a sequence of numbers or consecutive keyboard characters such as 3333333 or asdfgh. Any dictionary word (regardless of language), abbreviations, and words spelled backward are weak passwords. The list of common passwords also includes personal information, such as your children or pet's name, telephone number, house numbers, etc. The Hotmail team is rolling out a new security feature that will prevent you from choosing a very common password when recovering a compromised Hotmail account, signing up for a Hotmail account or when changing your password. In addition, if you are already using a common password, you may, at some point in the future, be asked to change it to a stronger password. The key to a strong password is both complexity and length. Complexity is not merely adding an upper case letter or an obvious misspelling, such as P@$$w0rd. That just won't pass muster. A list of the 500 worst passwords is in the references below. If you use any of those examples or even something similar it is time to change it, especially for your e-mail, banking or any site where you pay bills or conduct on-line purchases. Although some websites limit the number of characters allowed in a password, the longer your password, the harder it will be for it to be compromised. Test the passwords you use with the Password Checker. If your password is weak or medium in strength, make it experiment with the Password Checker adding characters, with a combination of upper and lower case letters, numbers and keyboard symbols. Hey! My friend’s account was hacked! Dealing with hijacked Hotmail accounts has long been a top priority for the Hotmail team. The Hotmail Safety and Security blog recently reported about an increase in hijacked accounts and spam emails sent to a account owner's contact list without their knowledge. Junk Mail Settings is set to Exclusive, which prevents mail from being delivered to the Inbox. Unfortunately, the account owner is not always the first person to discover that their account has been hacked. Instead, it is the recipients of the spam or phishing emails that arrived in their inbox from their friend's hacked account. Now, in addition to contacting your friend about the problem with their account, the Hotmail team is incorporating a way to report a compromised account. When Hotmail receives the report, the information is added to the other information from their compromise detection engine to determine if the account has been compromised. If the reported account is a Yahoo! or Gmail account, arrangements have been made with those providers for the information to be forwarded to them to use in their respective systems to recover hacked accounts. When the account owner attempts to access their account, they will be referred to the account recovery process. With the release of the July 12, 2011, Security Bulletin, Windows Vista Service Pack 1 (SP1) has reached its end of support life cycle. In the case of a service pack, "End of Support" means that automatic fixes, updates and online technical assistance will no longer be provided by Microsoft. Don't be a victim to malware. Update to the latest service pack to stay up to date with security updates and reduce the chances for infection. As shown in the table below from the Windows lifecycle fact sheet - Microsoft Windows, the only services packs still supported are for Windows XP SP3, Windows Vista, SP2 and Windows 7 SP1. If you are not sure if you have installed the latest service pack, you can easily find out by clicking the Start button, right-click Computer and select Properties. SP2 will be listed in the Windows edition section if it has already been installed. In the event you discovered SP2 has not been installed yet, Microsoft has provided very complete instructions installing Windows Vista SP2, including recommendations to follow prior to updating to SP2. Following the "Before You Begin" recommendations at Learn how to install Windows Vista Service Pack 2 (SP2) will help ensure a smooth upgrade to SP2. Microsoft released four (4) bulletins, one rated Critical and three rated Important. The bulletins address issues in Microsoft Windows and Office. Twenty-two (22) vulnerabilities are be closed with those bulletins. As indicated in the below-linked Security Research and Defense blog post, if you are not yet prepared to install the MS11-053 security update, you can close off the attack surface by preventing any Bluetooth device from connecting to your computer. In reviewing the Executive Summaries from the Security Bulletin Summary, note that updates are included that will require a restart. Regardless of the recommendation, it is always best to restart your computer after applying updates. WinPatrol PLUS Special Half-price Sale! 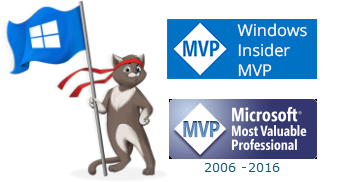 Scotty, the Windows Watchdog, has changed over the years to keep up with the changes in the Windows operating systems he monitors. WinPatrol is a multi-purpose utility designed to increase performance and protect against unwanted changes to your Windows Computer. The program was introduced in the days of Windows 95 and is compatible with every Windows Operating System, both 32- and 64-bit. WinPatrol is free for personal use and also has a one-time payment licensed PLUS version. If you've been waiting for some extra cash to upgrade to WinPatrol PLUS, now is the time! For a limited time, Bill Pytlovany is offering a special half-price sale. Get WinPatrol PLUS for a one-time fee of $14.95! On Tuesday, July 12, 2011, Microsoft is planning to release four (4) bulletins, one rated Critical and three rated Important. The bulletins will be addressing issues in Microsoft Windows and Office. Twenty-two (22) vulnerabilities will be closed with those bulletins. In addition to the upcoming security updates, the MSRC Blog also referenced the Special Edition Security Intelligence Report (SIR) entitled Battling the Rustock Threat. The special SIR provides new data on the Rustock botnet and the impact of the malware on computers around the world.